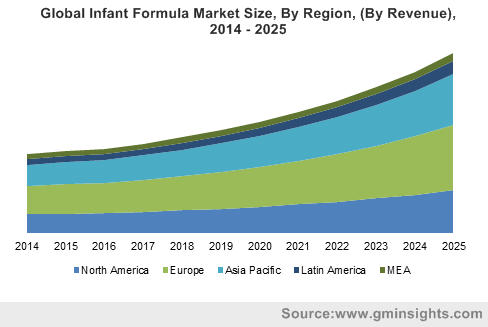 Global Infant Formula Market size was more than USD 52 billion in 2018 and will witness 9.8% CAGR during the forecast timespan. 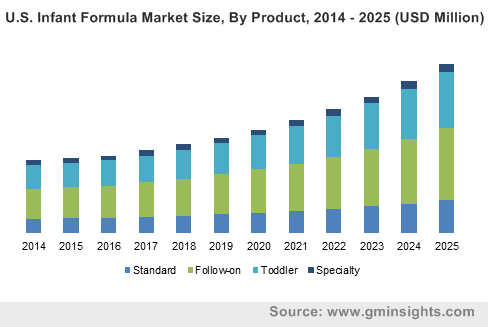 The major factor which will drive the infant formula market growth over the forecast duration will be the increasing number of infants born every year. For instance, according to the United Nations, global infant population in 2015 was 673.6 million and is likely to reach 733.3 million by 2025. This growth in infant population shall have positive impact on the global market growth in next few years. In addition, increasing number of working mothers, driven by economic growth which brings more women into the workforce, is a key infant formula market growth driver from past several years and projected to fuel the product demand over the forecast period. Moreover, increasing number of middle-class households in emerging economies including India, Indonesia, Thailand, Malaysia, South Korea, etc., have resulted in economic and population growth and rise in number of consumers who can afford infant formula for their babies This has accelerated product demand during the forecast timespan. 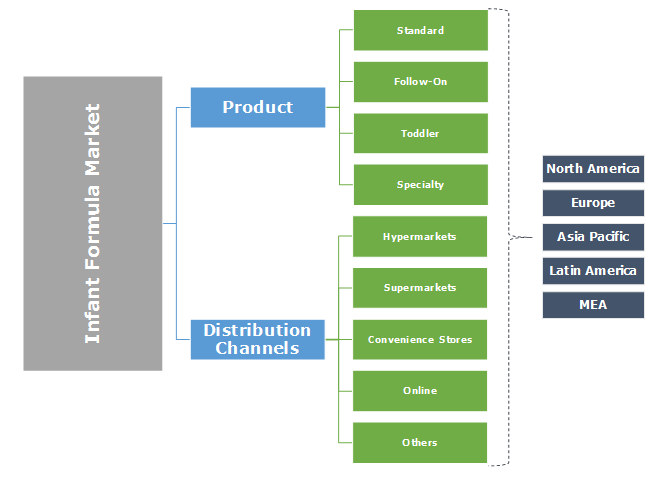 Increasing supermarket penetration across the globe will fuel the infant formula market size growth during the forecast timespan. Increasing supermarket density ensures the product availability to customers. In addition, increasing product presence on online platform will have positive impact on the market growth in the coming years. Rapidly growing e-commerce industry will create more growth avenues for product over the forecast period. According to United States, Department of Commerce, U.S. consumers spent more than USD 510 billion on e-commerce platforms in 2018, which was 14% higher than previous year. This high growth in the e-commerce market will fuel product demand in next few years. The regulatory hurdle associated with infant formula production is likely to restrict product demand over the forecast period. Many countries and regulatory authorities are implementing stringent quality and safety standards for product manufacturers. For instance, The China Certification and Accreditation Administration (CNCA) has given approval of sale to only 94 brands among over 800 foreign brands. In addition, cost associated with product manufacturing and high technology usage in the market will be the major barriers for new entrants in the market. Also, limited product awareness in rural regions of Asia Pacific and Africa may restrict the infant formula market to some extent in near future. Follow-on product segment accounted for over 40% market share in 2018 and forecast to grow with a significant CAGR over the forecast timespan. 0–6 months infants are highly dependent on breast feeding, after the 6th month, usage of follow-on infant formula acts as substitution to breast milk. Toddler infant formula will be the fastest growing segment in the coming years. Increasing health awareness will propel the product demand. In addition, changing lifestyle and increasing disposable income of people in emerging economies will drive the product demand in next few years. Specialty product segment was having the lowest market share in 2018 and will moderate CAGR during the forecast period. This can be attributed to low product usage in age group above 3 years. After particular age babies start to consume other food items and nutrition sources. Supermarkets accounted major market share in global baby food market in 2018 and projected to grow with highest CAGR in near future. Supermarkets are one of the fastest growing retail formats in recent times. The wide variety of products, real time shopping experience and budget pricing has been attracting varied strata of society from past several years. Product manufacturers and distributors are competing to grab the top spots in supermarket shelves to get more eyeball and increase conversion ratio. Hypermarket was one of the major distribution channels in 2018 and will expand with a prominent CAGR during the forecast period. Heavy discounts offered by hypermarkets was major attribute behind its growing penetration across the globe. Asia Pacific infant formula market shall experience significant growth during the forecast timespan. China was the largest product consumer in 2018 and shall remain the largest over the forecast duration. Abandonment of the one-child policy by China will have positive influence on the Asia Pacific market during forecast timeframe. Europe held a prominent share in infant formula market in 2018 and forecast to grow with a 9.8% CAGR during the forecast period. European market is growing at a relative slow pace compared to Asia Pacific, which is attributed to comparatively low birth rate. In addition, high baby health awareness and several initiatives to propagate mothers breastfeeding shall hamper the infant formula demand over the forecast timespan. 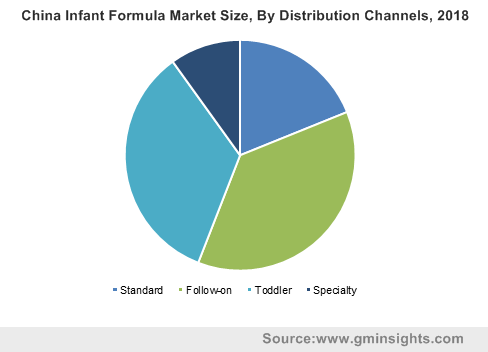 The infant formula market has seen substantial consolidation, some multinational giants such as Nestlé, Abbott, Danone and Mead Johnson are holding major market share in global market. This can be attributed to the strong brand identity and large multinational distribution network. Nestlé and Danone dominate in all four infant formula categories, Abbott and Reckitt Benckiser possess their relative strength in the standard and follow-on product categories. Other regional producers operating in the industry include Perrigo Nutritionals, Arla Food Ingredients, Hero Group, HiPP, Otsuka Pharmaceutical Co. Ltd, Bubs Australia, etc. Major players operating in the industry are involved in the merger and acquisition strategy to increase the customer base and market presence. For instance, In April 2012, Nestle acquired Pfizer Nutrition, one of the prominent baby food and infant formula producers globally, at USD 11.85 billion. This move has increased the Nestle infant formula product portfolio. Infant formula is primarily composed of lactose/ sugar, dried skim milk and refined vegetable oil. It is one of the highly regulated food segments and requires specific manufacturing capabilities and quality assurance. Product is gaining popularity among masses owing to increasing working class women across the globe. It is used to satisfy the nutritional needs of infants. They are classified according to the age of baby. Product categories includes standard infant formula for 0-6 months, follow-on infant formula for 6-12 months, toddler infant formula for 1-3 years and a specialty infant formula category covering products such as hypo-allergenic-, lactose-free- and anti-reflux formulas for all ages.